Since today is Halloween and with plastic skeleton's hanging on doorsteps everywhere I figured I could cover something from the skeleton. 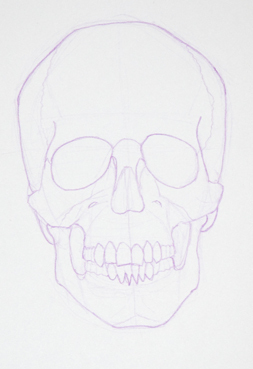 Today, I will cover the basic anatomy of the human skull. Below you will find two charts diagramming the bones of the human skull, a frontal view (anterior aspect) and a side view (lateral aspect). I have labeled the bones and key parts of the skull for reference when discussing the head. As you can see the cranium is actually made up of several bones fused together, the frontal, occipital, parietal, sphenoid, and temporal bones. Notice the large projection at the bottom of the cranium. This is the mastoid process. This is an important landmark as several muscles of the neck attach to this spot and will help with finding how the head and neck relate and move together. 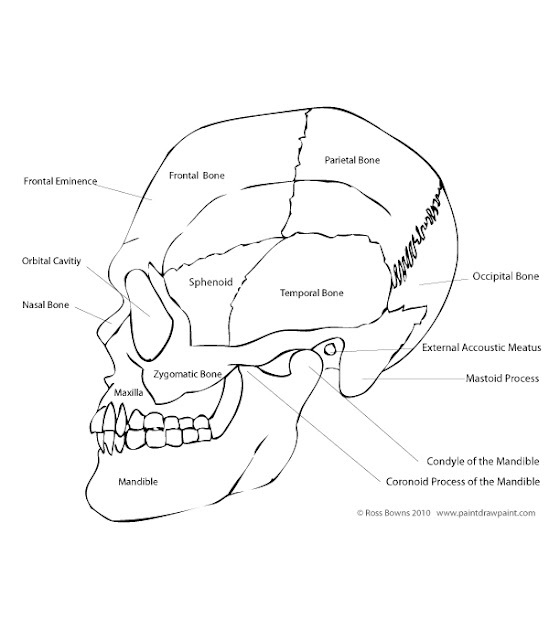 Sometimes you will see the term zygomatic process in diagrams, don't confuse this term the zygomatic bone. 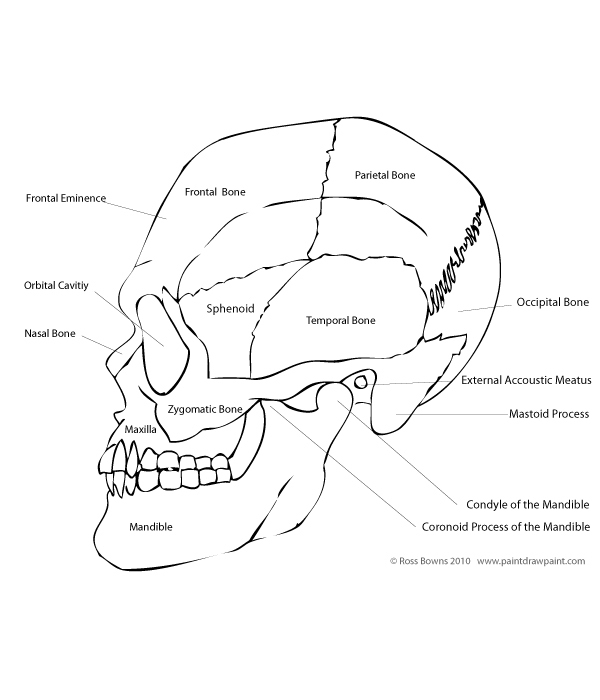 The zygomatic process actually refers to area made up of parts of several bones, including the zygomatic bone. The zygomatic bone is the cheek bone and gives shape to the upper cheek. The bones that give structure to the mouth and jaw are the maxilla and mandible. Along with the teeth, the maxilla forms the U shape of the upper part of mouth and attaches to the nasal and zygomatic bones. The mandible, or the jaw bone, is the underlying structure of the lower part of the mouth, the chin, and the jaw line. The frontal bone provides most of the shape of the forehead. There are a few key elements that play an important role in the shape. 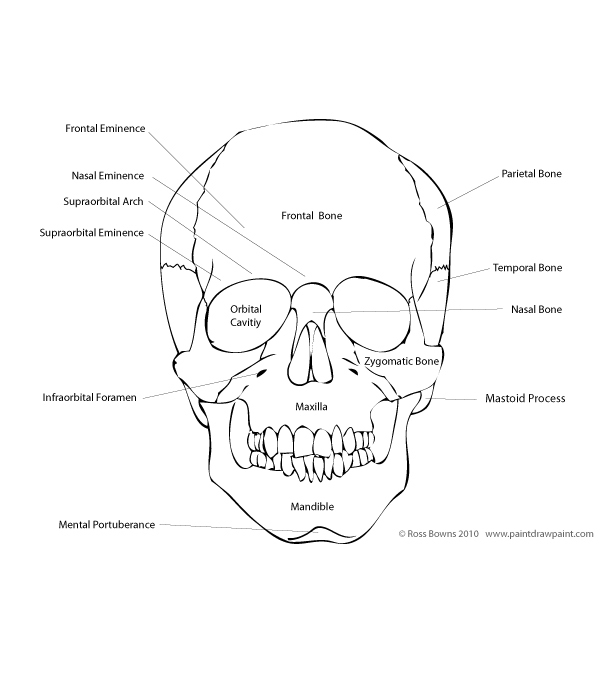 The frontal eminence is a part the frontal bone that rises out of the bone that helps give the forehead shape. The supraorbital arch and supraorbital eminence are parts of the frontal bone that give shape to the brow line. The eyes sit in the orbital cavities that is shaped by the bones surrounding them, the frontal, nasal, maxillary, and zygomatic bones. The external accoustic meatus is the hole in the skull for the ear canal. A reason for understanding the skull is that it plays a major part in the structure and the movement of the head and face. Also, you will be able to identify the bone structure creating the surface planes. The next step could be to learn how the muscles attach to the face and what the each muscle's action is.